The European Union High Representative for Foreign Affairs and Security Policy, Federica Mogherini, has said that Russia must play an important role in the political efforts to resolve the Syrian crisis. On the one hand, speaking at a press conference after an EU Council meeting on Monday, she confirmed EU concerns over the launch of the Russian military operation in Syria, which is not confined to strikes against ISIL and other groups that are declared terrorist by the United Nations. On the other hand, she stressed that Russia can play a very important role in the sense of putting pressure on the (Bashar al-Assad) regime and getting the regime officials involved in the political transition process. This process must involve all leading players in the region, and certainly the United States and Russia, she said. Mogherini also stressed that she considers EU-Russia talks over the Syrian problem to be useful. Apart from the work that Staffan de Mistura is doing with Russia, the EU can contact Russia directly to see whether it is possible to secure a political transformation (in Syria), the launch of a political process, she said. 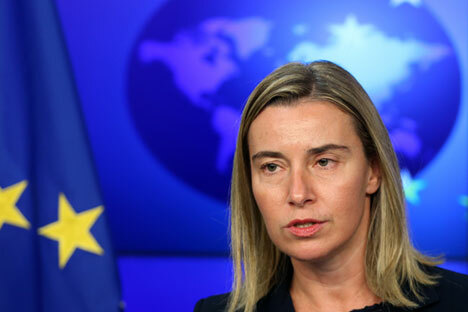 Mogherini said that she believes the EU can find common language with Russia to resolve the Syrian issue.